What to wear for a wedding must be one of the most searched terms on the internet come spring/summer. I myself have 100% googled it on multiple occasions – precisely the same number of weddings I’ve been to! So when ASOS asked to collaborate on a summer occasion I knew instantly that I wanted to pick weddings. Partially because it’s an interesting topic that will hopefully help you guys with some inspo, partially because I love getting dressed up. The main issue I normally have with wedding dressing is that the shops and websites I normally am drawn to for wedding dressing are usually super expensive and formal. Two things I’m not down with. Don’t get me wrong for the right item that can be worn multiple times I’m all for investing but if you’re just quickly buying something for the day, you want cheap, fast and versatile. I know I said about expensive items being versatile but I pretty much use this rule for everything in my wardrobe. So to help you guys out I’ve picked out two different ASOS wedding outfit ideas, both with the same jewellery and accessories so you can re use – always thinking of those ways to wear am I right?! These looks could 100% be re purposed for other occasions both smart and casual which is exactly why I love them so much! This jumpsuit called out to me from the sea of jumpsuits on ASOS. Partially because it’s that beautiful blush colour I just cannot resist, and partially because it’s a glorified tent . . and I’m saying this in the best way possible. The neckline is really flattering along with the dainty straps and pretty button up front which means despite the fact that it is a tent it doesn’t look like it. Everything about it up to the point it cuts off at the ankle just give the most beautiful finish, can you tell I’ve fallen in love with it? The main selling point of it was the size. Weddings are boozy and full of food so the last thing you want to be stuck in all day is a bodycon dress, managing portion size and breathing in is not something I’m willing to do for a piece of clothing. Let it all hang loose! 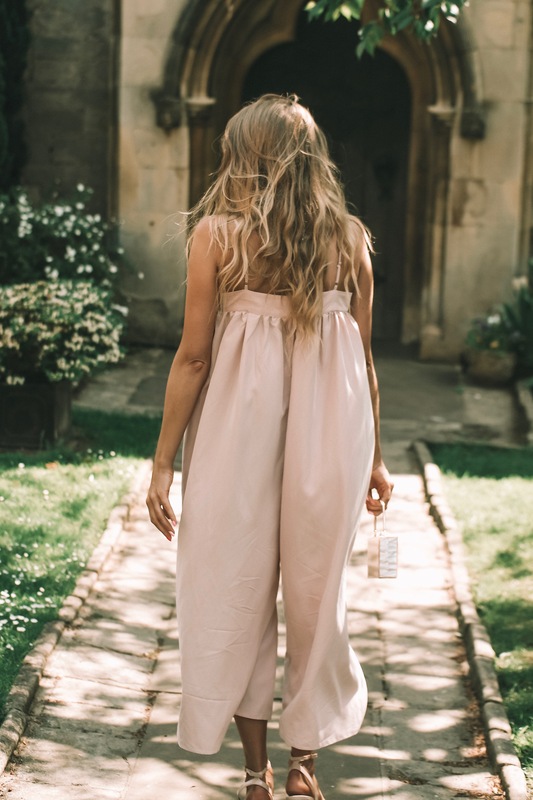 I’d definitely say that this is a timeless jumpsuit that I’d wear time and time again for all sorts of occasions, I’d even dress it down with a denim jacket and some Superga trainers. I added some super simple accessories to finish it off, a medallion necklace and a set of medallion earrings. Medallions are super on trend right now so if you want to go all in buy a few of this style in a variety of lengths and layer them up. 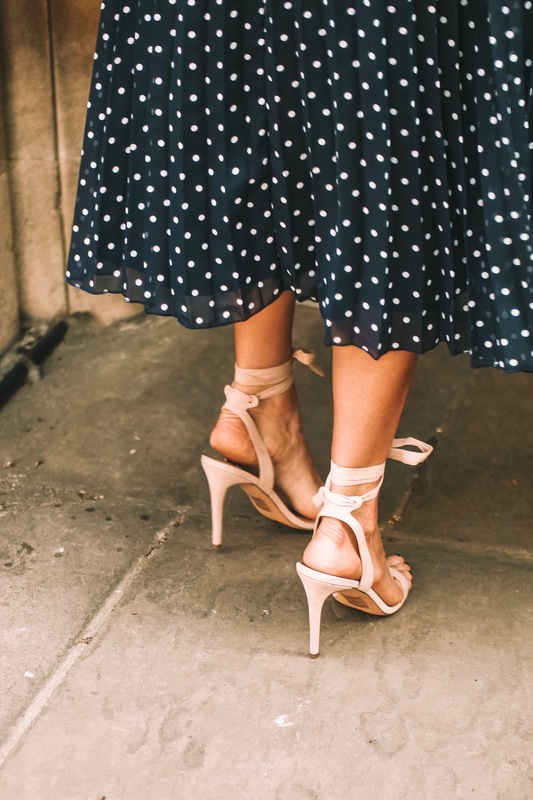 I then added some really simple sandals in a manageable heel . . always thinking about that dancing, some skinny sunnies because is there any other style to be wearing this season? And a mother of pearl effect box bag which if I may say so myself, finishes this outfit off perfectly. So I’ve said before to you guys that when it comes to weddings and dresses, length is a tricky topic. What length is ok? I always err on the side of caution and stick to a midi, personally I think they’re super flattering anyway so it’s no skin off my nose! I went for this ASOS one because of the beautiful back detail. it’s super pretty and with the low front it’s anything but boring. I definitely think you can get away with more on a midi dress because the majority of your legs are covered. Imagine wearing a low back low front mini dress to a wedding!! I love the navy polka dot style, again like the jumpsuit it’s a timeless style that won’t date and you can wear time and time again to other occasions, graduations, the races . . whatever takes your fancy! The best thing about this one isn’t the size and allowance for stomach filling, it’s definitely not a case of this, but the way that it moves! It’s such a fun dress it’s perfect for taking it to the dancefloor and pulling some moves. I went with the same accessories as before minus the shoes because I believe that they’re super easy to wear for any outfit. All of them are so neutral plus super on trend you could keep them for any weddings you have coming up. I switched the shoes out for a pair that tie up as I thought they were slightly more flattering and really added a little something something to the outfit. What do you think? Make sure you let me know what your favourite look is! I definitely think I’ve fallen for the jumpsuit! It’s so beautiful right?! This post is a paid partnership with Asos & Reward Style however all thoughts, opinions and creative direction are my own.